Combining comfort and practicality, these Tolix style bar stools will bring style to any breakout or dining area. The comfortable dark wooden seat fuses with the robust and easy to clean metal frame to create a high stool to suit almost any decor. Perfect for bars, cafes and breakout areas, we have 10 stools and 2 matching tables in stock. 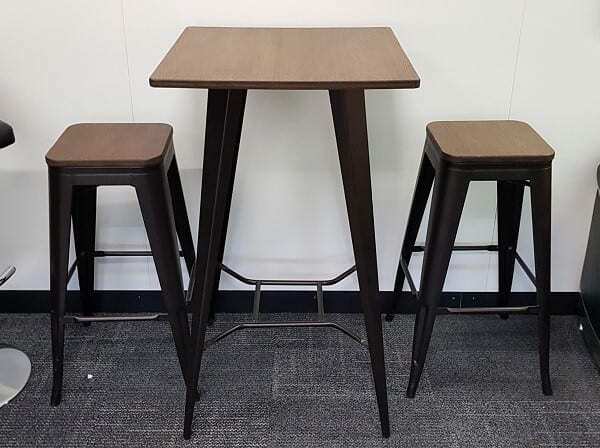 If you would like further information on these stools, our sales team can be contacted by calling 07944 508282. If you are viewing our website on a mobile device, just click on the telephone icon located at the bottom of this page. However, if these stools are not exactly what you are looking for, we have others available among our miscellaneous items. Just click on the link provided. As always, you can view these stools in our showroom along with all our other used office furniture.